Guillermo is known as "The Count" to his fans in Cuba...Guillermo keeps a close eye on the Cuban National Series, particularly his beloved Matanzas Crocodiles…Matanzas is located on Cuba's northern shore, due east of Havana…the word translates to "killings," in reference to the murder of shipwreck survivors in the area in 1510…he says "it would be an honor" to one day return to Cuba to play for them...His emergence onto the larger baseball scene came thanks to a strong performance in the 2013 World Baseball Classic...Has a chance to become only the third position player in Rays history who throws left and bats right…would join Damon Hollins (2005-06) and Dave McCarty (2002). Appeared in 125 games and made 88 starts (69CF, 19-LF) over three stints with the Mariners: Opening Day-April 21, May 1-August 19 and August 27 through the end of the season… played 11 games for Triple-A Tacoma...Was one of five qualifying outfielders in the majors to record a 1.000 fielding pct., joining OAK Mark Canha, KC/ARI Jon Jay, HOU Josh Reddick and LAA Mike Trout…was the second Mariners outfielder to ever do that, following Franklin Gutierrez in 2010...His 7 sacrifice bunts tied for 4th in the AL...Was named the Mariners recipient of the Heart and Hustle Award by the Major League Baseball Players Alumni Association (MLBPAA)…the Heart and Hustle Award honors active players who demonstrate a passion for the game of baseball and best embody its values, spirit and traditions…it is also the only award in MLB that is voted on by former players...Hit .298/.411/.457 (28-for-94) with 6 2B, 3 HR and 11 RBI in the 7th inning or later...On May 15 vs. TEX, delivered a walk-off single in the 11th inning off Alex Claudio, his second career walk-off hit...Played 20 games for the Aguilas Cibaenas in the Dominican Winter League...Acquired by the Rays from the Mariners in a five-player trade on Nov 8. MLB Totals - Hit .249 (96x386) with 43 runs, 16 doubles, 6 home runs and 24 RBI in 123 games with Seattle... Medical Update - Underwent successful surgery on his right shoulder to repair a Bankart lesion on Oct. 9, performed by Dr. John Uribe in Miami, Florida... For Starters - Made 104 starts in the outfield, 6th-most in club history by a rookie, trailing Ruppert Jones in 1977 (154), Ichiro Suzuki in 2001 (148), Jeremy Reed in 2005 (129), Ben Gamel in 2017 (127) and Ken Griffey Jr. in 1989 (120)... The Opener - Named to his first Opening Day roster... Do the Splits - Hit .310 (40x129) with 7 double, 3 home runs, 13 RBI, a .360 on-base percentage and a .434 slugging mark vs. left-handed pitchers…against right-handers, hit .218 (56x257) with 9 doubles, 3 home runs, 11 RBI, a .294 on-base percentage and a .288 slugging mark... Wear It - His 11 HBP ranked T7th in the AL (also: Jonathan Schoop and George Springer)... Solid Start - From the beginning of the season through August 18, hit .286 (83x290) with 39 runs, 14 doubles, 6 home runs, 22 RBI and 18 walks in 90 games... Tough Finish - While dealing with a Bankart lesion in his right shoulder, hit .135 (13x96) with 4 runs, 2 doubles and 2 RBI in 33 games from August 19 through the end of the season... Walk It Off - Delivered a pinch-hit, walk-off single in the 9th inning on May 18 vs. Chicago-AL…became the 16th different Mariner (done 17x) to record a pinch-hit, walk-off base hit (last: Adam Lind, 7/18/16 vs. CWS, 3-run home run)... Clutch - Played a key role in the Mariners 6-5, 13-inning, 4-hour-and-59-minute victory on July 25 vs. Boston…went 3-for-6 with 2 runs, 1 home run and 3 RBI…belted a 3-run home run in the 2nd inning… singled with two outs in the bottom of the 13th and eventually scored the game-winning run. MLB Totals - Hit .250 (23x92) with 12 runs, 3 doubles, 1 home run, 12 RBI, and .349 on-base mark in 45 games...MLB Debut - Recalled from AAA Tacoma on July 29 and was 0-for-1 in his MLB debut that day at Chicago-NL... A First - Recorded his first career Major League hit and RBI off of David Price on Aug. 2 vs. Boston…finished the game 1-for-4 with 1 run and 1 RBI... Goodbye Baseball - First MLB home run in 3rd inning on Aug. 6 vs. Los Angeles-AL...Minors - Hit .340 (36x106) with 21 runs, 5 doubles, 1 triple, 2 home runs, 13 RBI, 7 walks, .385 on-base mark in 26 games with AAA Tacoma…in AA Jackson, hit .293 (60x205) with 39 runs, 7 doubles, 2 triples, 2 home runs, 34 RBI and a .405 on-base mark in 58 games. 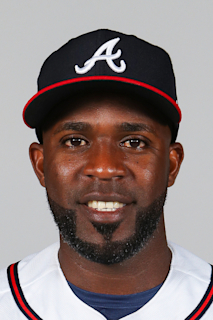 Did not play professional baseball in 2015 after defecting from Cuba in early 2015… After his defection, Heredia trained in Miami. Recorded just one plate appearance with Matanzas…went 1-for-1 with 1 RBI. Hit .255 (49x192) with 11 doubles, 1 home run and 9 RBI in 61 games…also appeared in the World Baseball Classic for Cuba, batting .167 (3x18) with 2 runs, 1 RBI and 2 walks. In 68 games, hit .265 (65x245) with 9 doubles, 6 home runs and 24 RBI. Career year with Matanzas, batting .343 (125x364) with 91 runs, 19 doubles, 9 triples, 10 home runs, 52 RBI, a .439 on-base percentage and a .527 slugging percentage…won Gold Glove award in center field (.977 fielding percentage with 9 assists) in 96 games. 2012: In 68 games, hit .265 (65x245) with 9 doubles, 6 home runs and 24 RBI. Made his debut at the age of 18 with Matanzas in the Serie Nacional Cuban League… appeared in 67 games, batting .290 (42x145) with 11 doubles, 2 home runs and 16 RBI. November 13, 2018 OF Guillermo Heredia assigned to Aguilas Cibaenas. November 8, 2018 Seattle Mariners traded C Mike Zunino, LF Guillermo Heredia and LHP Michael Plassmeyer to Tampa Bay Rays for CF Mallex Smith and Jake Fraley. August 27, 2018 Seattle Mariners recalled LF Guillermo Heredia from Tacoma Rainiers. August 20, 2018 Seattle Mariners optioned LF Guillermo Heredia to Tacoma Rainiers. May 1, 2018 Seattle Mariners recalled Guillermo Heredia from Tacoma Rainiers. April 22, 2018 Seattle Mariners optioned LF Guillermo Heredia to Tacoma Rainiers. August 22, 2016 Seattle Mariners recalled Guillermo Heredia from Tacoma Rainiers. August 10, 2016 Seattle Mariners optioned CF Guillermo Heredia to Tacoma Rainiers. July 29, 2016 Seattle Mariners recalled Guillermo Heredia from Tacoma Rainiers. June 23, 2016 CF Guillermo Heredia assigned to Tacoma Rainiers. June 23, 2016 CF Guillermo Heredia roster status changed by Jackson Generals. March 13, 2016 Seattle Mariners optioned CF Guillermo Heredia to Jackson Generals. March 1, 2016 Seattle Mariners signed free agent Guillermo Heredia.